Good power supplies are mandatory to obtain the best possible performance from your EASYDCC equipment. For example, the DCPS120U power supply provides up to 30A of capacity for short periods of time. This surge capability allows your ZoneMaster booster to power up entire yards full of sound-equipped locomotives. For non-USA locations, the DCPS120U is the perfect solution for powering your Command Station using the optional 3.5mm plug and cable - shown at the bottom of the page. It can also serve as the power supply for your plug-in throttle bus Extender circuit board. The perfect companion for your ZoneMaster Boosters. This high efficiency power supply offers the best compromise between high power and small size. It is safe for all types of household voltages and is perfectly suited for any railroad, anywhere in the world. The peak track voltage is set with the slide switch with the 12V setting perfect for most N layouts and the 15V setting for HO and O layouts. Higher voltages may be selected for larger scales. The DCPS120U is perfect for the ZoneMaster Boosters. It will provide up to 8 Amps which is more than sufficient to allow the maximum output current from any of the CVP ZoneMaster Boosters. Universal AC Line Input - 110V - 240V Works Worldwide: This is a universal supply suitable for all primary voltages found throughout the world. The supplied plug fits most European wall outlets. For unusual wall outlet requirements, the plug can be cut off and a suitable one can be attached. Easy Voltage Selection: The desired output voltage is selected with the side-mounted slide switch. 120 Watts Of Power: The maximum power output is 120 Watts. To determine the maximum available current at a specific voltage setting, divide the power rating (120W) by the output voltage. For example, with the 15V setting, up to 8 Amps can be supplied. Built-In USB Charging Jack: The USB jack is rated at 5V and 1 Amp. It is perfect for charging the T1300 OPS throttle. Fully Protected: The DCPS120U is protected against overloading, short circuits and overheating. The output will shut down should any of these faults occur and automatically reset when the fault is cleared. 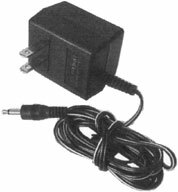 Line Cord and 2mm DC Plug Included: A USA AC line cord is included. The built-in heavy duty DC plug fits the 2.1mm jack found on all ZoneMaster Boosters. Suitable for powering the Command Station, XF-Series Wireless Receiver or the Extender, this plug-in transformer comes with a 3.5mm plug to match the power jacks on the Command Station and the XF Series Wireless Receivers. To use it for the Extender, cut off the plug, strip and tie the two wires and attach to the Extender's power input terminals. For use in the Americas and Japan only. Plugs into any 110VAC outlet. If you intend to use a DCPS120U power supply or some other type of power supply for your Command Station, you will need a matching 3.5mm plug and cable to make the connection. This inexpensive cable matches the power input socket on the Command Station. The plug is attached to 12 inches of two-conductor cable. Prices do not include shipping or handling. All prices subject to change without notice.